HAVE YOU NOTICED THAT THE CHILDREN GET MORE INTERESTED IN THE SNACKS THAT LOOK AMUSING? Using our mini non-stick silicone candy molds maker, you can easily create healthy and beautiful snacks, which will surprise you and your kids, as well as your friends! This treat is capable of CHEERING YOU UP, CREATING A FESTIVE ATMOSPHERE. You only need a little patience and imagination to create a fairy tale with your own hands. - Versatility - it contains 5 kinds of animals - a bear, a lion, a monkey, a penguin and a worm shapes. - DIY candy, different gummy dinosaurs bears, gelatin worms, fruit snack candy shaped like monkeys, lions, as well as cake décor and different chocolate treats. - The gummy worms gumdrop mold does not absorb odors. - Has a wide temperature range from - 40 to 450°F. - Easy to clean in the sink or dishwasher. - The products are easy to take out by flipping the jelly mold silicone inside out. - The mold does not get deformed, is comfortable to keep folded. A GREAT BONUS GIFT - ONE DROPPER. RISK FREE: If you're not satisfied with The Silly Pops sour candy molds baby, we guarantee that you will get your money back. Homemade candy is not a problem! 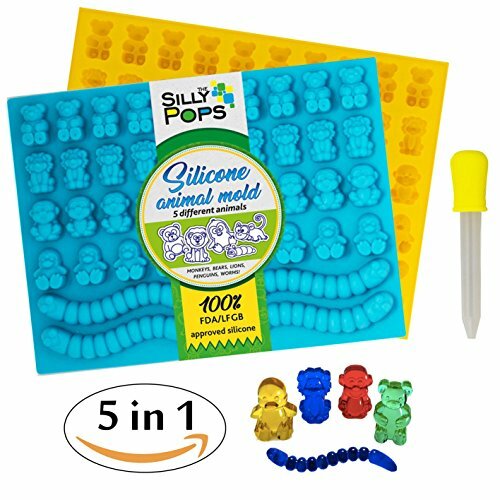 WITH OUR SILICONE MOLD "The Silly Pops" YOU WILL BE ABLE TO CREATE REAL WORKS OF ART. Such a variety of sweets made at home will impress your guests and really please the children who have a sweet tooth. CLICK THE "ADD TO CART BUTTON" button above and Get Your New hard candy molds! If you have any questions about this product by The Silly Pops, contact us by completing and submitting the form below. If you are looking for a specif part number, please include it with your message.